But the rest of the video - nearly two hours of additional footage showing what happened before and after the encounter - adds important context that strongly contradicts the media's narrative. 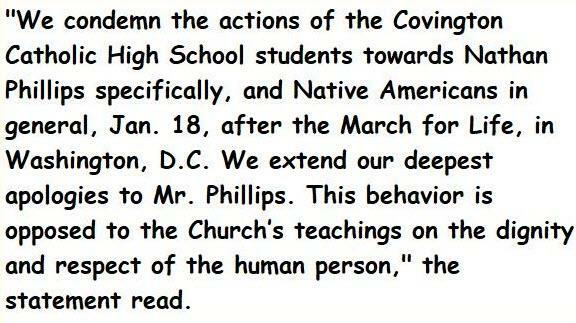 Phillips enters the picture around the 1:12 mark, but if you skip to that part, you miss an hour of the Black Hebrew Israelites hurling obscenities at the students. They call them crackers, faggots, and pedophiles. At the 1:20 mark (which comes after the Phillips incident) they call one of the few black students the n-word and tell him that his friends are going to murder him and steal his organs. At the 1:25 mark, they complain that "you give faggots rights," which prompted booing from the students. Throughout the video they threaten the kids with violence, and attempt to goad them into attacking first. The students resisted these taunts admirably: They laughed at the hecklers, and they perform a few of their school's sports cheers. "There was that moment when I realized I've put myself between beast and prey," Phillips said. "These young men were beastly and these old black individuals was their prey, and I stood in between them and so they needed their pounds of flesh and they were looking at me for that." He also claimed that he heard chants of "build the wall." While I cannot rule out the possibility that some of the kids indeed chanted this—those who were wearing MAGA hats are presumably Trump supporters—I did not hear a single utterance of the phrase in the nearly two hours of video footage I watched. Admittedly, the kids do a lot of chanting and it's not always possible to tell what they are saying. Their stated explanation is that they engaged in a series of school sports chants: That's what one student told a local news reporter. His account largely tracks with the video. "We are an all-male school that loves to get hyped up," said this student. "And as we have done for years prior, we decided to do some cheers to pass time. 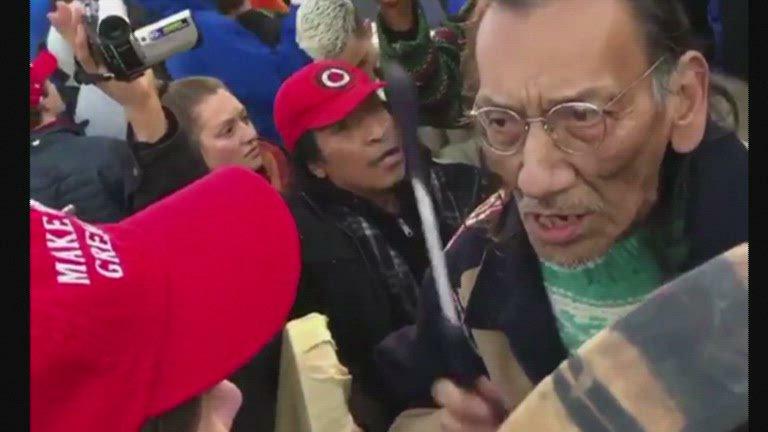 In the midst of our cheers, we were approached by a group of adults led by Nathan Phillips, with Phillips beating his drum. They forced their way to the center of our group. We initially thought this was a cultural display since he was beating along to our cheers and so we clapped to the beat." 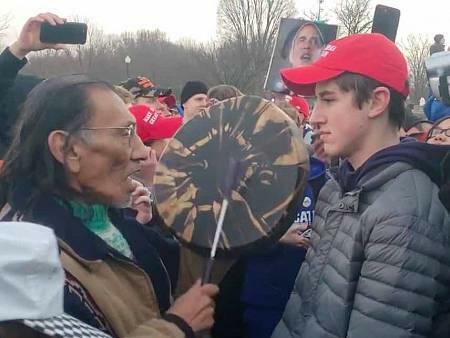 It would be impossible to definitively state that none of the young men did anything wrong, offensive, or problematic, at some point, and maybe the smiling student was attempting to intimidate Phillips. But there's shockingly little evidence of wrongdoing, unless donning a Trump hat and standing in a group of other people doing the same is now an act of harassment or violence. Phillips' account, meanwhile, is at best flawed, and arguably deliberately misleading. Unless other information emerges, the school's best move would be to have a conversation with the boys about the incident, perhaps discuss some strategies for remaining on perfect behavior at highly charged political rallies—where everybody is recording everything on a cell phone—and let that be the end of it. The boys are undoubtedly owed an apology from the numerous people who joined this social media pile-on. This is shaping up to be one of the biggest major media misfires in quite some time.